In this construction video tutorial, learn the detailed process for computing materials toward domes or sloped slab specifically toward half spherical domes and segmental domes. The tutorial will be very useful for quantity surveyors. 1) surface area and volume of solid as well as hollow sphere which will facilitate you to make calculation for domes easily. 2) Cement, Sand, crushed stone, steel and surface paint /plaster/tiles area or any other material which are estimated in form of area toward half spherical dome. 3) Cement, Sand, crushed stone , steel and surface paint /plaster/tiles area or any other material which are estimated in form of area toward segmental spherical dome. For making estimation of solid sphere, the formula for finding out the sphere volume should be 4πR3/3. 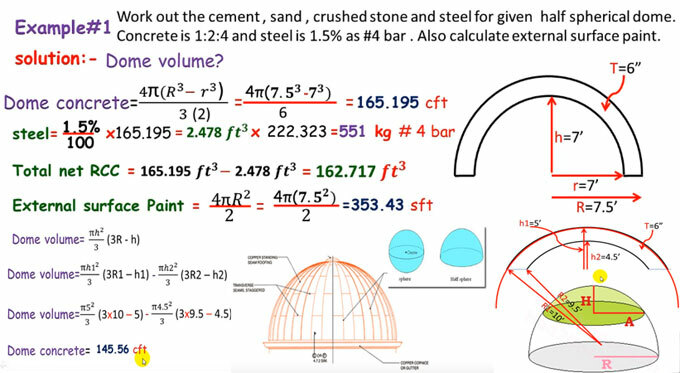 Here, in this video, solution is given for a problem where you have to calculate the cement, sand, crushed stone and steel for specified spherical dome. The ratio of concrete is given as 1:2:4 and steel is 1.5%. Number 4 bar is used. Calculation is also made for external surface paint. To get more details, watch the following video tutorial.